Dr. Arun C. Gulani, M.D., M.S. 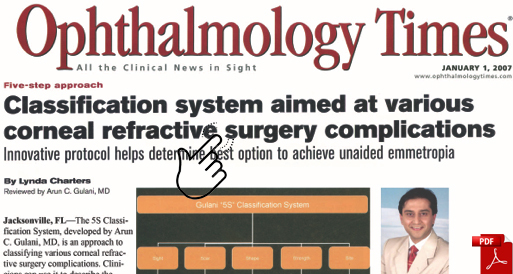 is among a select few eye surgeons throughout the nation who besides completing a residency in ophthalmology (Where he was selected as Chief resident) spent two full years dedicated to learning advanced LASIK and CATARACT surgery as a fellow. He uniquely learned not only the surgery but also the art of LASIK and CATARACT and interacted and learnt from the pioneers of various refractive surgical procedures from all over the world thus acquiring a wide experience in the full spectrum of refractive surgery (Surgeries to decrease dependence on glasses). This ability sets him apart as he can decide what surgical procedure is best suited for a particular patient and treat each patient selectively to their best expected outcome. Dr. Gulani has vast knowledge and is also the reason why he is not easily swayed by industry marketing releases and "New Technology" promises. In most cases he may have already tested and used the technology abroad and or has known of similar technology in the past enough to make a solid judgment of incorporating it in his practice for betterment of patient care. The patient’s advantage is that they do not have a surgeon using industry sales pitch but rather a surgeon who dedicatedly makes accurate suggestions in their best interest. 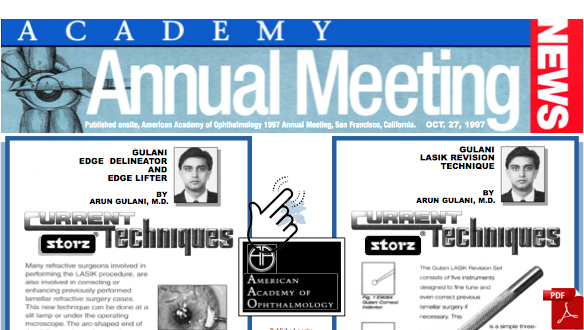 Dr. Gulani is a distinguished and invited speaker at major conferences and specialized forums worldwide. 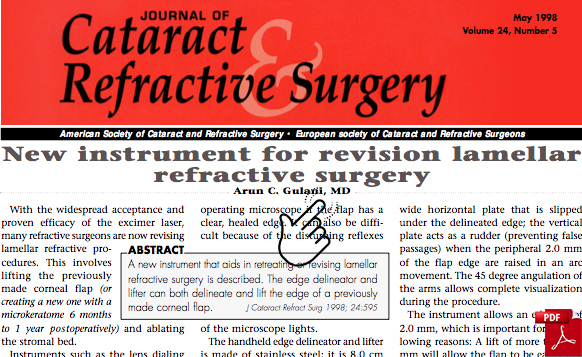 Click here for an extensive list of books, chapters and original articles authored by Dr. Gulani for Lasik surgeons worldwide. His expertise extends well beyond the normal range of laser refractive abilities with his corneal reconstructive and transplant surgical skills. 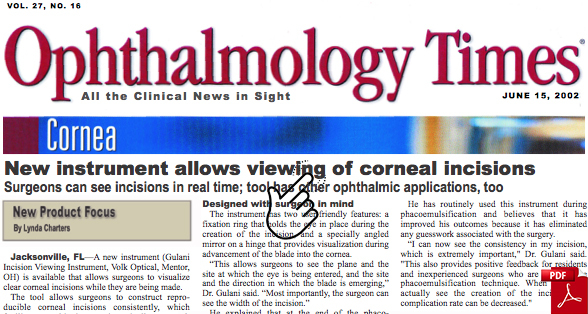 He teaches these concepts in his Lasik complication management courses internationally. Dr. Gulani is a "Doctor's Doctor." He is widely cited in the academic community and has invented several important surgical instruments and techniques. He has contributed to more than 150 scholarly courses, books, lectures, workshops, forums, and original papers worldwide. 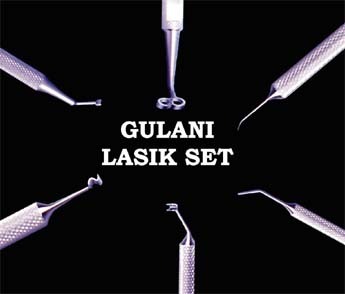 The Gulani series of Lasik instruments are used by Lasik surgeons all over the world and have received numerous awards for innovation. Dr. Gulani constantly engages to improve surgical methods. Many of his creative deliberations have resulted in a wide spectrum of instruments. He is a medical consultant and thought leader for the Eye Care Industry. His innovative instrument designs and applications have received numerous prestigious awards. 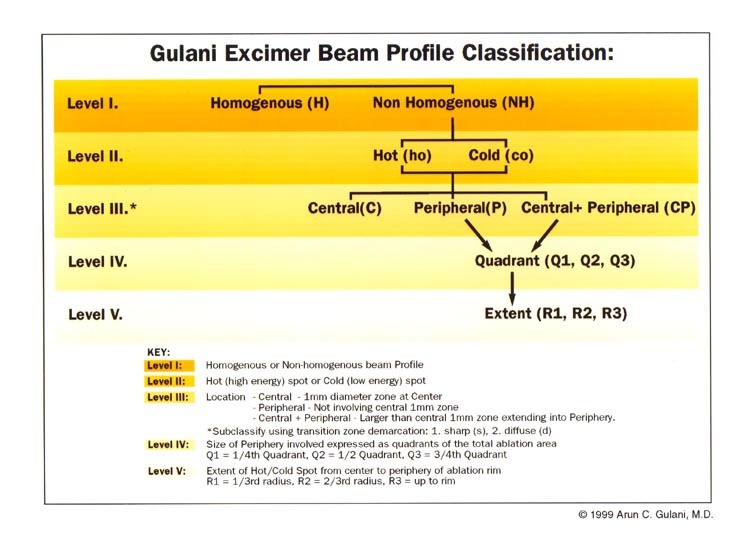 Gulani Classification Systems and Gulani Laser Precision Protocols have resulted from Dr. Gulani's teaching Lasik laser safety and calibration techniques worldwide. 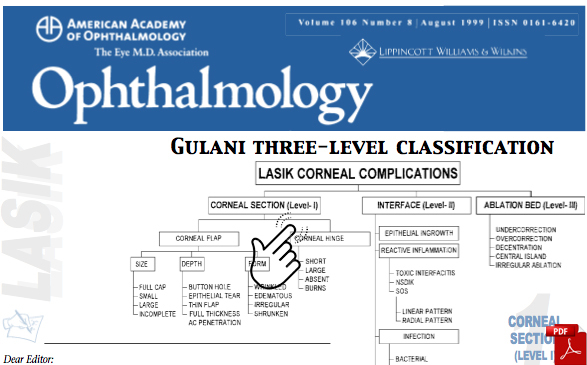 Here are the protocols that he contributed to the world of ophthalmology.